Rogier might not completely agree with Arabelia there. Happy 2017, everyone! I don’t usually say things like “this one’s going to be great!” because, really, I can’t possibly know what will happen. But I do know I’ll work hard to keep this project moving on and hopefully at some point I will print Volume 1. A lot needs to happen before that, though! I’ve been two weeks away from my computer and though I’ve enjoyed them, now I can’t wait to make pages! I haven’t completely disconnected from Bookwyrms, though, I wrote scripts for Volume 2. So thrilled about it! In any case, thank you all for reading the comic and I hope you keep enjoying it throughout this year too. anyway, on to a great year! You totally got Rogier there. That’s right, if you don’t work for it nothing’s going to be given to you! Thank you for your kind wishes, and have a great year you too! Congrats on the 100th page dear! :3 Also ugh I love the ending panel here so so much, I’d say it’s a good start for 2017 and Bookwyrms. <3 Cheers Lorena, keep working hard! Thank you so much, Karo!! <3 <3 I'm flattered that you liked that panel, I love your landscapes! ^o^ I hope you have a great 2017!! 100 pages! Quite a milestone. 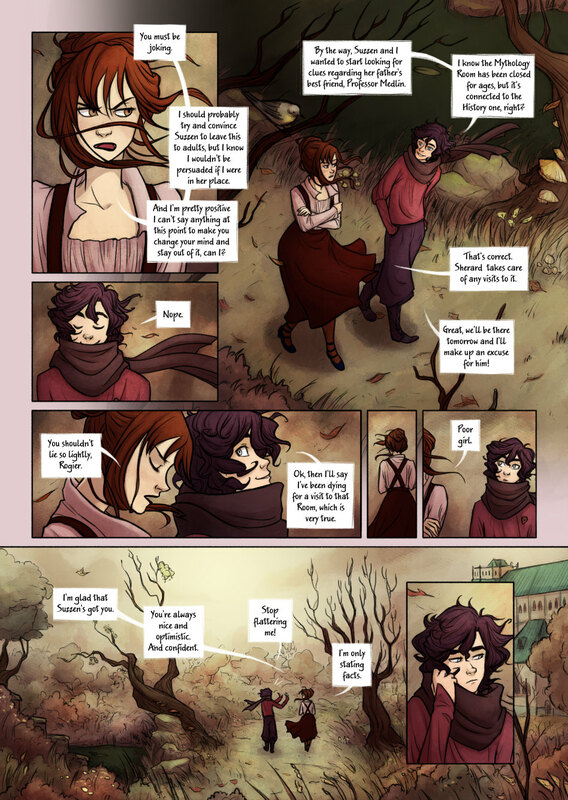 The atmosphere in this page is very… victorian for some reason. Maybe it’s the autumn atmosphere and the wind, but it’s very lovely. I don’t know who I like more, Arabelia or Kveldbera. Happy New Year to all, and to all a good life. Congrats on 100, also. Thank you very much! It makes me happy that you can’t decide between those two ^^ Have a great 2017!